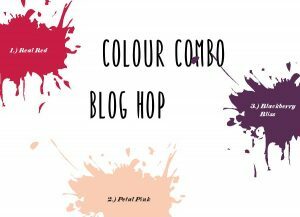 Welcome to this month’s Colour Combo Blog Hop. Whether you have arrived here from Astrid or started the blog Hop here, I hope you enjoy the projects you are about to see. With this blog hop we are given 3 colours and the 3 colours for October are: Real Red, Blackberry Bliss and Powder Pink. My first thought was would these colours go together, then what stamp set could I use that did not include flowers. I decided to use the Cookie-Cutter Christmas stamp set for 2 reasons, one is that I have not used it before and the other was that my husband and I have just heard that we are going to be first-time Grandparents in April. I therefore decided to use the teddy bear stamp for my card. As Stamping’ Up! have changed their ink pads this year and as I am in the process of changing over to the new ink pads, I was surprised to find that by using the different types of ink pad, I was able to make each teddy look different. 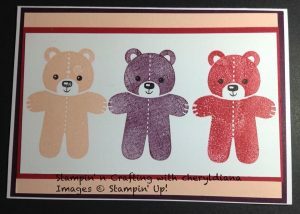 I first stamped a teddy bear in each of the 3 colours on to Whisper White card stock and mounted that onto Real Red card stock. This was then stuck onto the Powder Pink and Blackberry Bliss card stock. Finally this was stuck onto a Whisper White card base. I hope that you have enjoyed my card and that the colours have given you ideas for your own project. Please do leave comments as you hop around our blog hop. Please click the next button to hop on over to Elizabeth. Lovely cute card, thank you for sharing. Sweet teddy´s!! 🙂 Great card! Funny and cute card, Cheryl!